Short-finned pilot whales (Globicephala macrorhynchus) are distributed in all oceans (...here...). 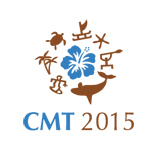 The IUCN Red List of threatened species classifies this species as data deficient. Recent research results have shown surprising life patterns for this relatively unknown cetacean species. First conclusions indicate that they form stable matrilineal kinship groups (...here...) and supposingly use call dialects (...here...). During 20 minute long and more than 1,000m deep dives (...here...) they search and hunt for squid (...here...) with a -for an aquatic mammal- unique hunting strategy . In the focus of hundreds of thousands of whale watchers per year (...here...), short-finned pilot whales represent an exciting dolphin species. pilot-whales.org wants to provide a vivid picture of this species and uses original acoustic (...here...) and visual (...here...) research recordings. Furthermore, pilot-whales.org provides scientific guidance on several biological life aspects of this species obtained from own research and from reports of the scientific community. Background informations on pilot-whales.org (...here...). pilot-whales.org does not conduct research solely on pilot whales. In collaboration with other researchers or in the context of distinctive research topics, sometimes other marine mammal species are in the focus of study. 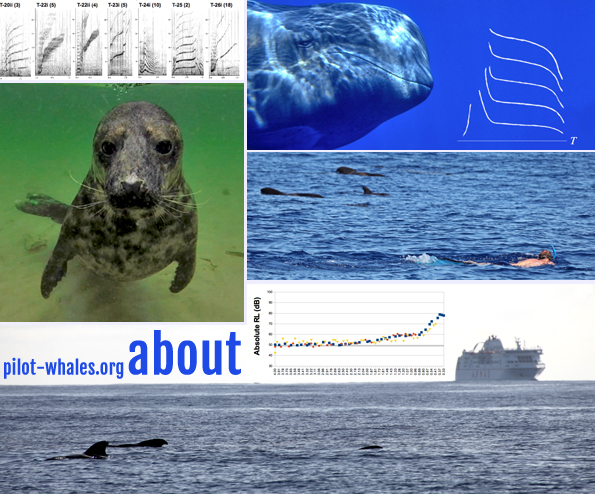 Recently, studies on grey seals (...here...), Amazon botos (...here...) and killer whales (...here...) were conducted. encounters (.mov file with 20 MB). Short-finned pilot whales are one of the main target species of the global whale watching industry. The hotspot is the southwest coast of Tenerife, Canary Islands. Pilot whales are encountered by thousands of whale watchers mostly in the context of boat-based excursions (...here...). As a popular segment of whale-watching tourism, commercial ‘swim-with-whale/dolphin-programmes’ (SWPs) have increased in recent decades and all over the world. Swimming with wild cetaceans has been discussed controversially among scientists and for some regions SWP are prohibited by law. Though SWPs can represent a sustainable and environmentally friendly whale-watching activity, there are potential risks to both the animals being viewed and the tourists. The possibility for injury to both animals and tourists needs to be minimised in order for wildlife tourism ventures to remain sustainable. 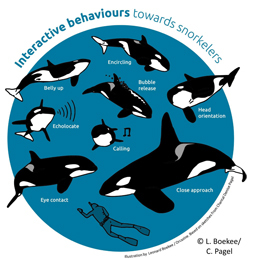 Cetacean behaviours towards snorkellers and divers during open-water encounters have received little attention and their structure and function mostly remain unclear. Humans are often in close and uncontrolled contact with the animals in their open-water environments, and exposed to unpredictable behaviours. Furthermore, humans might act or react inappropriately. During encounters with human swimmers pilot whales were reported to show threatening as well as affiliative behaviors (...here...). Own research (...here...) revealed 11 different interactive behaviors initiated by free-ranging pilot whales and directed to human swimmers (...here...). 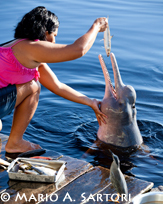 Click ...here... to see a woman hand-feeding a boto (.mov file with 14.9 MB). Click ...here... to see a single boto begging for fish-handouts (.mov file with 9.6 MB). 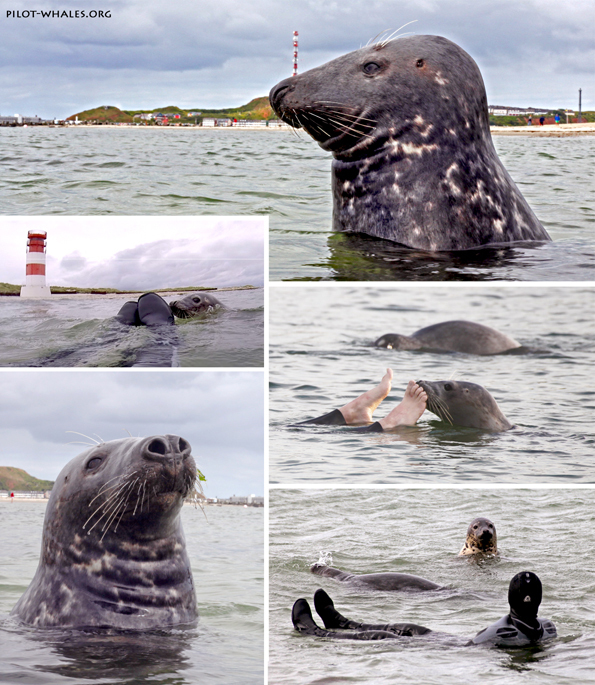 Click ...here... to see an in-water encounter of a grey seal with a human swimmer from underwater (.mov file with 13.4 MB). water surface (.mov file with 10.1 MB). Even in remote areas with uncomfortable sea and weather conditions, snorkellers and divers are seeking in-water encounters with cetaceans. See the publication on swim encounters with wild killer whales in northern Norway (...here...). Next to short-finned pilot whales more than 20 free-ranging whale and dolphin species have been encountered by human swimmers, divers and waders in open water environments. Like most cetacean species, short-finned pilot whales use a diverse acoustic signal repertoire in order to communicate with conspecifics (...here...), to navigate, to explore and to search for prey (...here...). During encounters with human swimmers, pilot whales emit echolocation clicks and direct them to their novel and unusual counterparts (...here...). 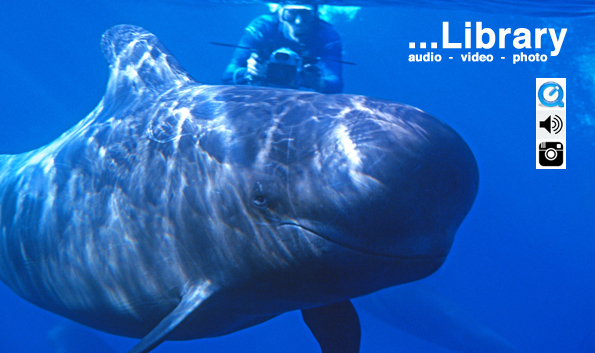 Their sophisticated acoustic communication system is vulnerable to underwater noise disturbance. Especially in the context of boat-based whale watching, acoustic signals can be potentially masked by engine and propeller noise (...here...). Click ...here... to see and mainly hear a group of short-finned pilot whales communicating (.mov file with 5.9 MB). The whales emit a variety of sounds such as clicks, whistles, grunts and calls. Short-finned pilot whales often live in coastal waters (...here...) and are confronted with a variety of anthropogenic impacts. In archipelagos such as the Canary or Hawaiian Islands they have to cope with maritime traffic and particularly with fast and high-speed ferries. Scars and dorsal injuries reveal that pilot whales are victims of ship strikes and it is likely that their acoustic communication will be somehow affected by underwater noise (...here...). It still remains an open question why whales do not avoid a collision by moving out of an approaching ship's path (...here...). See also the current field study (...here...). 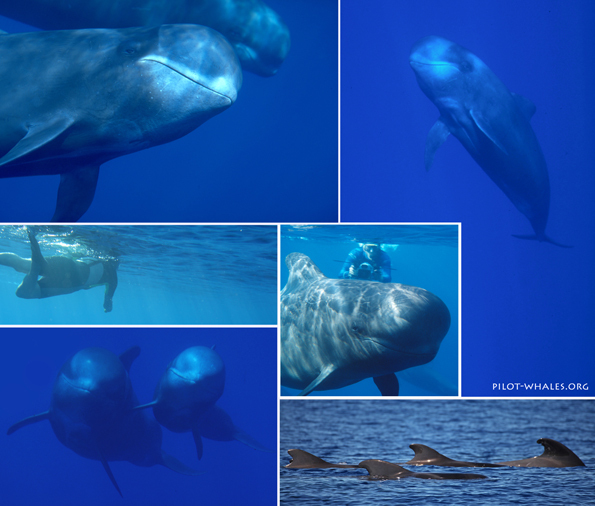 Short-finned pilot whales have distinctive markings and can be individually photo-identified (...here...). Researchers have globally used this technique to study the pilot whale social structure by analysing indivual association patterns (...here...). 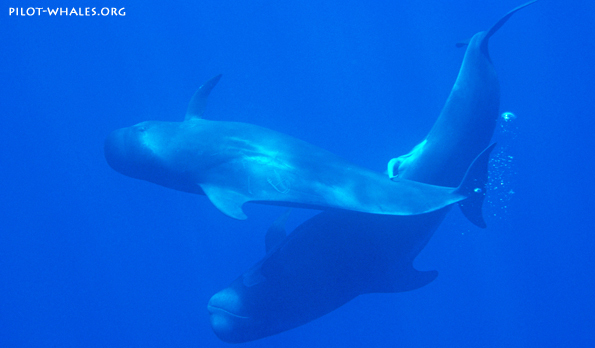 They found that short-finned pilot whales form stable social groupings, and further evidence (...here...) suggests that they live in matrilinear kinship groups. Within these they show a variety of acoustic (...here...) and non-acoustic (...here...) communication behaviors. Presumably they use call dialects (...here...) for the behavioral synchronization among group members. Click ...here... to see a large group meeting underwater (.mov file with 6.3 MB). As air-breathing marine mammals, short-finned pilot whales have to regularly sojourn at the water surface (...here...). Nevertheless, most of their time the whales spent beneath the surface (...here...). The combination of surface and underwater observations is important to explore the function of a distinctive behavior. From the surface it seems that e.g. a tailslap is a solely percussive behavior -a behavior with an acoustic signal function (...here...). From underwater an observer can get a different impression (...here...). Sometimes you meet cetaceans when you do not expect it. And sometimes you see behavioral performances, you have never seen before. During a ferry cruise from Tenerife to La Gomera (Canary Islands), a group of Gervais' beaked whales (Mesoplodon europaeus) heavily breached in unison. For a short moment, there were three individuals in the air at the same time. Gervais' beaked whales (.mov file with 2.2 MB). 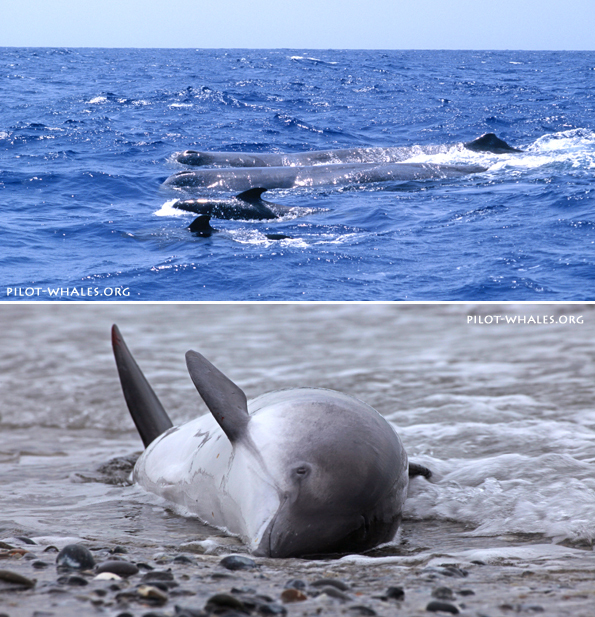 While searching for pilot whales, you often meet other marine mammal species as well. During research cruises or while simply outlooking from shores, you sometimes have the opportunity to be in the right time at the right place. …Here… are my examples. 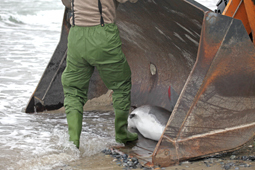 On a cold January afternoon a single harbor porpoise stranded on the beach of the island of Helgoland. The individual seemed to be in a healthy state and it was quite agile while floating somehow helpless. With the support of a local ranger and by using a heavy wheel loader, the animal was brought to the port where it was 'unloaded' in deeper waters. In response, the animal breached twice and went offshore. (.mov file with 2.2 MB).